I've had one of those days that start badly and get better as it goes and then goes pear-shaped again later on. Another thing I do when Best Beloved goes away is live like a gypsy. Bumblebee and I eat fast, makeshift meals, most often straight out of the saucepan. Pots and pans pile up, the floor goes unswept, and the bed unmade. The day he arrives home, I do a HUGE wash-up and a lick & spit of the house. This morning I filled the sink with hot, bubbly water, moved around a bit to gather the dirty objects (think opening scenes from Withnail & I, with a bit less mould) and turned back to find all the washing-up water over the floor. OH NOES! The sink has lost its seal! And no time to fix it or get a plumber! The one good thing was that cleaning up the water meant a clean kitchen floor. Later in the day I had the bright idea of doing the washing-up in the laundry sink, so BB did end up coming home to a clean kitchen, but also to a very stressed wife, who immediately ducked out the door and up to the studio to gather things for tomorrow. Don't get me started on heart attacks when looking out the School of Music cafe to see a parking inspector wandering dangerously close to the carpark I'd plopped into without a permit (he didn't get me, thank you Ceiling Cat). Or the fact that we have discovered that Bumblebee now fits my shoes, and has gone off to school in my nice black Baxter boots, bringing them back all boy-scuffed. Unfortunately most of my shoe wardrobe consists of men's shoes, so I'll have to hide my favorites until he grows out of them (in about two months). OK, printing done, time for bed. Best Beloved is away for work until Friday night. I worked until 1am last night, because I could. Best Beloved makes me breakfast in bed every weekday, but the catch is that he brings it to me at 6:30am, something I'm normally cranky about, but the truth is that if he's not around, I forget to eat breakfast, so I must learn to stop grumbling at 6:30am. and had a look around, and it is a really terrific show. I'll try to take some photies later in the day when the labels are up. What was I doing with this post? Oh! Thank goodness I wrote the title first. The snort de jour isn't staying up late nor forgetting to eat nor reminding you that I'm exhibiting; it is this. Enjoy. Some weeks you feel like there's time to sleep. Other weeks whack you on a treadmill and laugh as you try to cope with running uphill on the spot at high speed. This is one of the latter. I spent Saturday at a workshop run by American book-meister Ed Hutchins, learning really fun paper animation techniques. Not film animation, but more pop-up book methods. It was lots of fun, and I have a book of samples to show for it, but I can't show you because I took it in to the Bookstud to show my students and forgot to bring it home. Saturday night I HAD to go to two parties. I know you won't be surprised when I tell you that I am a First Class Party Piker, especially when I've used up my daily quota of acting pleasant. But when one party is a farewell for someone going overseas and you won't see them again for ages, and the other party is the 21st of someone you've fondly watched survive adolescence, piking is just not an option. Unfortunately party 1 gave me vodka lime cocktails and party 2 gave me champagne, and when I mix grape with grain potatoes I get a terrible hangover. And -- no joke -- spent a weird period during the movie ads seemingly going through the cinema's bin. 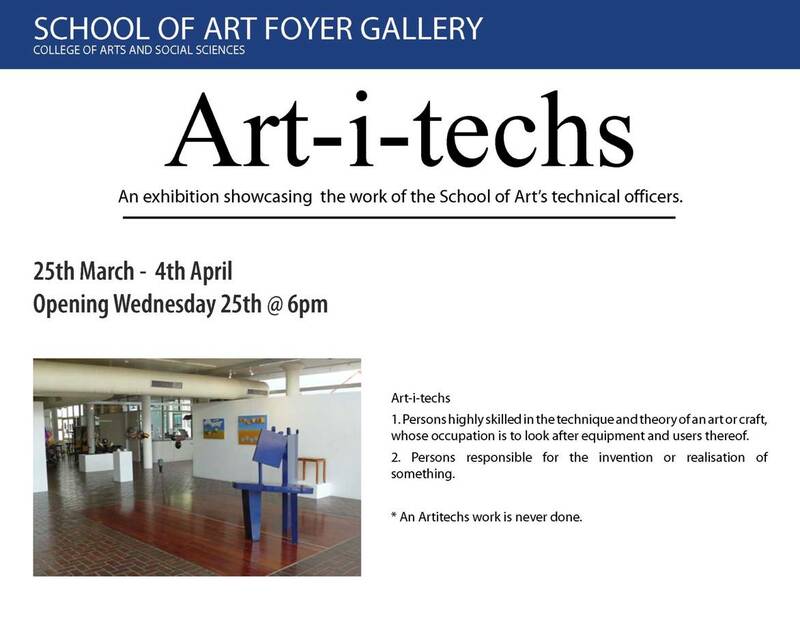 WEDNESDAY 25 MARCH IS NOT ONLY COLONEL AND LADY DUCK'S WEDDING ANNIVERSARY BUT ALSO THE OPENING OF THE ART-I-TECH EXHIBITION AT THE ANU SCHOOL OF ART FOYER GALLERY AT 6PM. A showcase of art works by the school's excellent [insert creative collective noun here] of Technical Officers, including myself. -- and preparing my head for participation in this coming weekend's TWO FIRES FESTIVAL at Braidwood, NSW. Also trying to plan the school holidays around everyone's different access needs and working schedules, and realising I have to take Bumblebee shoe-shopping in the next 3 days so that he has something besides crocs to wear at next week's SCHOOL CAMP! And do a stocktake of his clothes. He turns 12 in a couple of weeks, and he's taller than ever. PUFF! PANT! Ye gods, it's frigging APRIL next week... someone turn the treadmill off! Please! At least I have managed to update my website about the lovely works in progress for my upcoming Books to Hold or Let Go exhibition at Craft ACT. One thing off the checklist tonight. 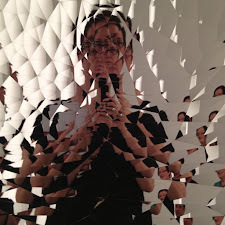 I have resolved to write more about the actual arty farty stuff I've been doing lately. But not tonight, Josephine, not tonight. -- The air is crisp, like fresh spring leaves. -- Do you know the time in Zurich? -- It is you! no one believed you would survive. Zoe, as a reward for scanning her pics yesterday, pointed me towards Eastern Bloc lolcats with a twist. Heaven! For real-life heavenly kitties, meet Beatrice and Harriet. Their names are as perfect as their looks. 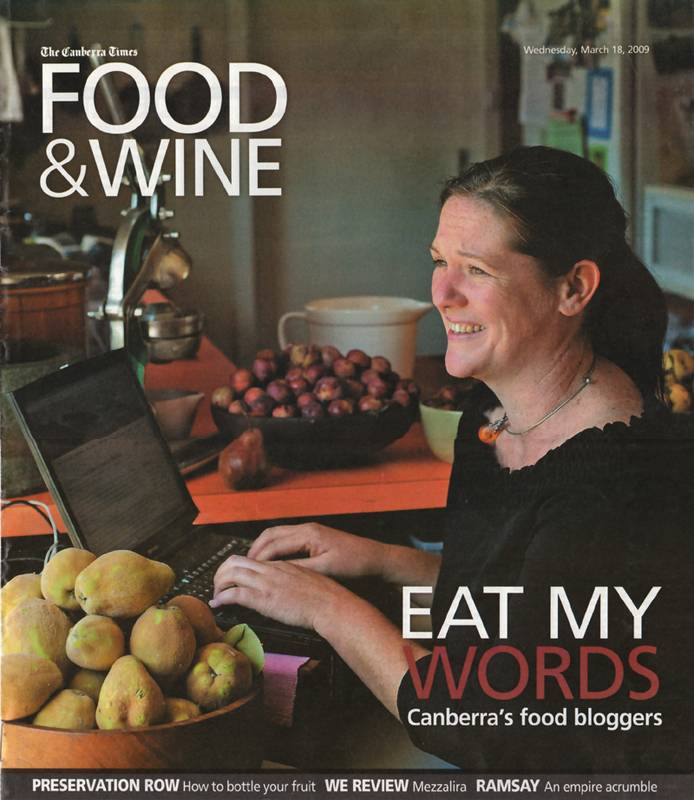 Crazybrave Zoe is front page of the Canberra Times food supplement today! Huzzar! 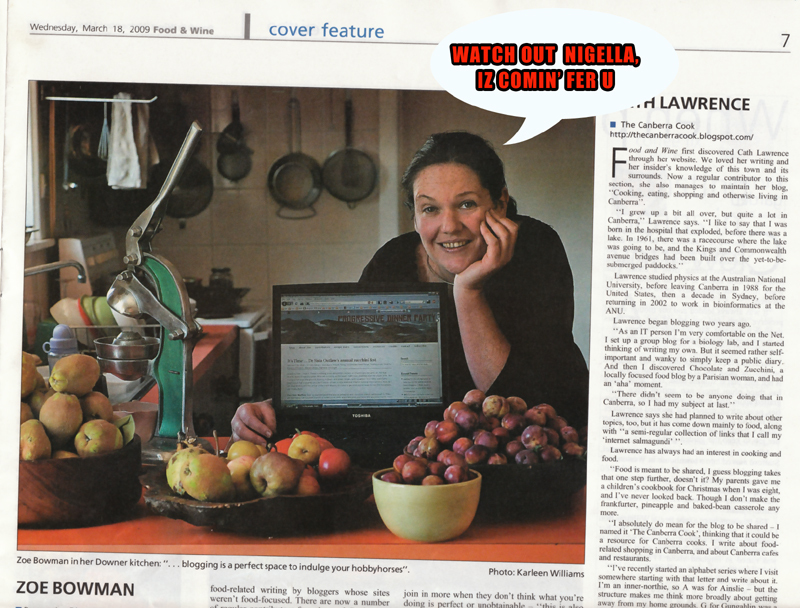 I think she should definitely dash down to the Canberra Times and order big glossy copies of these, and any others. Good for the Foodblogging portfolio. Definitely. Today's snort was bushy's tea (home-brand black tea, stolen from the student stash, with condensed milk) up the nose and over the Bookstud keybort, when reading this post from Master of Cerebellum, Tim T.
Closely followed when mopping up by another one of Bad News Hughes' classics. Don't follow that link if you're feeling delicate. It's pretty raw in many senses of the word. I've been working hard over the weekend, teaching Japanese and Coptic bookbinding at (the beautifully renovated) Megalo, so I had to pack a weekend's worth of downtime into last night's fanfic-ish Lost in Austen. Combined with a couple of stiff G&Ts, it did very well as a mini-break, apart from the fact that I spent a small amount of time before dropping off to sleep wondering if Mr Darcy would still love Amanda Price when her fake auburn hair developed a major root-line. Today I did more Coptic binding with my art school students before traipsing them over to the Menzies Library to view some more of the Petr Herel collection of artists' books. This is an archive of many of the books and print folios made during the 20-odd years of the Graphic Investigations Workshop under the careful and philosophical Czech eye of Petr Herel. It's an under-valued and under-used little gem in the ANU library collections, and fully able to be accessed by appointment. I think I'm the only person to use it, so I try to take a group of students at least twice a year, and even if they're revisiting with me, they still come away delighted. The link above is to a poor archival website; if you'd like to browse the actual records, click here. I'm tempted to buy a couple and take them apart. GAH! Byrd's having another vertical stouch, this time not with an ignorant local politician, but with someone messing with his head in a different way. Watch THAT space (it's at the Lyneham Shops, if you're interested). One thing about Byrd, he's never been afraid to rework his own sprays. They've picked the wrong target, for sure. You may have been wondering about Sarsaparilla, the group blog. It fell off teh interwebs. It's coming back properly at a site near you soon, but in the meantime check out SARS LITE! The setting was a classic end-of-summer Canberra afternoon: hot, dry, windy. The group was sitting outside under the carport, in a space kitted out with carpet offcuts, pine shelving and a hifi system playing Neil Diamond's Hot August Night on vinyl. The light was at first sharp and brittle, but it burnt away slowly as the records were changed. The women, sipping cold white wine, were brightly coloured in floral pinks and burnt orange. The men, sucking at recycled bottles of home brew, were discussing umpiring decisions from a local cricket game earlier that afternoon. The roast pork was ready and resting, the cream for the plummy dessert had been whipped gently, with special ingredients folded into it for extra lushness. I had closed my eyes and I was in 1977, in my parents' Duntroon backyard. The cat that just jumped on my lap could have been our black & white Persian, Sadie. 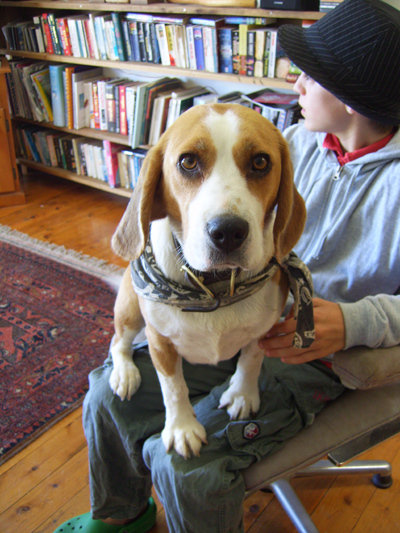 The dog that walked past was George, the Tasmanian Rock Hound* we shared with another Army family. The kids shouting in the front yard in their pyjamas were all my cousins, avoiding bed by keeping away from the adults. But I was sitting near the adults, a quarter of an ear to their conversation, another quarter on the music, the rest in my book, sitting very close to have first crack at the food when it finally arrived, and old enough to be included in their meal rather than fed earlier with the smaller kids. I suddenly opened my eyes, and it was 2009, and it was Zoe's backyard, or rather, side-yard. Owen had umpired a game that afternoon, it was his home brew, their Neil Diamond, Dr Sista-Outlaw's pink dress, my orange top, our kids using light-sabres to whip each other up into a frenzy before the tears fell and we shoved the lot of them in front of a DVD. And it was Zoe's amazing milk-roasted pork with couscous and green beans, followed by something divinely creamy and plummy. And I was still old enough to eat with the big kids. In fact, I *was* the big kid, the oldest of everyone there. Last night we drove along the highway for 90 minutes to eat a meal with my beloved buddy Sacha, who was down from Brisbane for five days to mind her son in her ex-partner's house while he went to some men's drumming thingy in Tasmania (or so his son says, with a cheeky smile). Sacha is a wonderful host: she invited a whole stack of lovely locals that she wanted to catch up with, cooked a (gentle) curry meal and plied us with wine and chocolate, then put us to bed in a spare room with a couple of recent glossy mags (she knows my tastes well) and let us sleep in. Isn't he lovely? He belongs to Sacha's son, and was quite the star of the party, especially when he started hoeing into some icecubes (the only thing he managed to wrangle out of us, despite using his eyes to his best begging capacity, and after his food-stealing attempts were thwarted), licking and crunching them up happily. 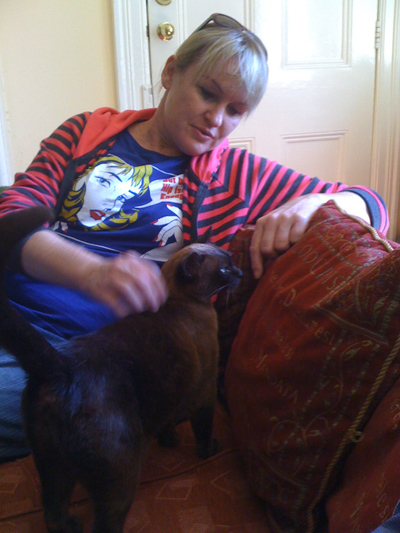 These photos were taken this morning, when Bumblebee's dad (who lives reasonably near by) generously allowed B to drop by and see Sacha for a few hours of his access weekend. 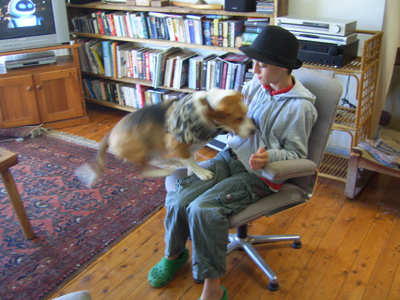 The boy and the dog got along swimmingly. Such sweet kitties, a male and female, who are wholly indoor cats, but have a wired-in cat run at the back, between the house and the amazing ceramics studio. Sigh! Imagine having a lovely house with another one attached to the back, just for making things! Double sigh. Anyway, dinner is ready (takeaway, we couldn't be arsed cooking). See ya. *Actually an Australian Terrier, but he didn't chase balls or sticks. He was passionately devoted to rocks. He rocked. I just found a letterpress stationer with a wicked sense of humour. All these greeting cards (and many more) are on sale right now. Get in line behind me. Ahh, the start of the academic year brings a new routine: bliss. I'm such a 'flight path' kinda gal in many all ways. I don't mind my routines changing, as long as the changes settle into another kind of routine before too long. I swear, if society crashed tomorrow with no power and food and neighbours fighting each other for water, I'd be cool with it as long as I could settle into some sort of foraging/scragging routine. The 'flight path' these days is a circuit between the house, the university and my studio. I tend only to do things that fit within whatever flight path I'm on, and that includes seeing friends, unfortunately, and has always been thus unless they squawk enough to break me out of my daily reverie, or front up to my house bearing cold bottles of wine. Dr Sista Outlaw managed it last weekend, Bernice has turned into a weekly fronter in return for a meal and/or the loungeroom airbed (she commutes to Canberra for some of Kevin's PS largesse), and Byrd has worked out that the best time to catch me is 8.30pm on a Wednesday as I settle in for my dose of Adam Hill. I'm very committed -- we, as a family, have become very committed -- to constructing our lives around our local area so that our flight paths can be travelled by bicycle. I think there's only one day of the week now where I absolutely have to drive the car, and that's because the Aged Poet lives across the lake and I often have to drive her places, but I guess if I ever had to, she's not so far that I couldn't ride. And now that I'm carting things between studio and BookStud, I've finally got around to getting a bicycle basket! What a difference a tray makes; having a basket is just so good that I'm kicking myself for not having organised it years ago. Even not having to wear a backpack as I'm riding is helping my shoulders and neck to relax after work. And now that the weather is getting cool in the mornings, I'm loving the ride. Happy! It's also nice to have a head-space separation between the Bookstud and my studio. I've been meaning to tackle the helltype in the Bookstud for years now, but usually get distracted by the urge to fold a few pages /set some type/ print a wee poster while I talk to students or residents, but now I can really knuckle down and clean the place up. Mind you, this is an annual resolution (happy new academic year!) and rarely gets far, but I've already cleaned out one tray of type bundles this morning, that included projects that are at least ten years old, and I'm feeling righteous. My ultimate aim is to have all the type in its right place, all the dust vacuumed up (I have a natty German type vacuum, with special speeds and netting over the hose etc), and all the type catalogued. And then I'll be starting on my own personal collection at my studio. Once I can lift the trays. That's one thing I'm NOT doing today. Sorting *only*. I also rediscovered the Book Studio blog, poor neglected creature that was put thoroughly on the backburner last year because there was just so much going on. Well, this year's visitor promises to have an exciting, constantly evolving project, and I'm going to do my darndest to document it on the blog. So if you're interested, throw the URL back on your feedreaders. OK, that's my tea-break done. Back to the type. I was going to write a lovely long post about going to Degas with Dr Sista Outlaw then going to am AMAZING pork dinner at Zoe's then doing other stuff today but I'm absolutely buggered and there's a handsome man calling to me from my bed.